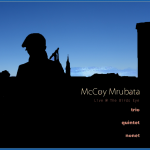 A limited edition of the latest double CD McCoy Mrubata Live @ The Birds Eye is out…Featuring greatest international musicians, You can buy a copy at all the Music Moods outlets, Just CDs in Braamfontein , at the Orbit and also available on iTunes. Fill in the details below if you would like to buy from the main source (signed Copy). Thank you, I hope you’ll enjoy It once you get yourself a copy. Copyright © 2019 McCoy Mrubata | Multi Award-winning Saxophonist / Recording artist. All rights reserved.